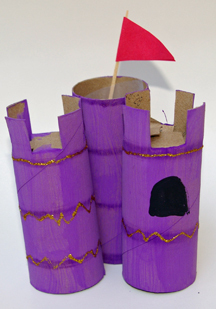 Preschoolers can use their imaginations decorating this castle! 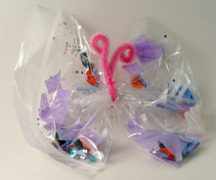 You can use sequins, glitter and whatever else you have on hand. 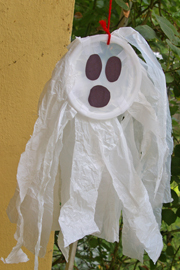 You could even paint a paper plate blue for the moat around the castle. What You Need: toilet paper or paper towel rolls, tempera paint, paintbrush, glitter glue, scissors, toothpick, construction paper. 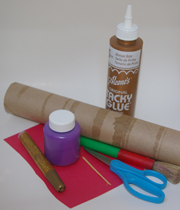 How You Make It: Paint toilet paper tubes or cut-up paper towel rolls. Make 8 small cuts at one end of two of the rolls and fold four tabs inward to form turret. Decorate however you’d like and glue edges together to form castle. Cut construction paper into rectangle, fold over toothpick, glue and then trim to triangle flag shape. Glue or tape to inside of castle. This is a craft and a fun toy all in one! Preschoolers design their snake and then they can take it for a “walk” by pulling it along with the yarn. 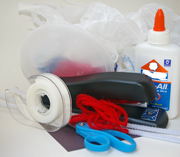 What You Need: paper towel tube, scissors, tempera or poster paints, googly eyes, scrap of red felt, red yarn, glitter glue, paintbrush, glue. How You make It: Adult cuts the paper towel roll into six sections of similar width. Preschooler creatively paints the sections, adding glitter glue and other details. 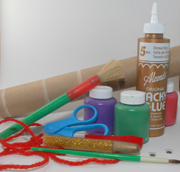 Once paint is dry, help preschooler apply googly eyes and glue red felt forked tongue to the “head” tube section. Loop yarn around last section and tie; thread the yarn through the rest of the section, leaving it loose at the head as a leash to pull the snake.